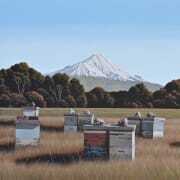 We are proud to announce Page Blackie Gallery's representation of Michael Hight. One of Michael's incredible canvases is currently hanging in our LANDSCAPE exhibition, in our front window. Featuring in the Herald yesterday was the collaborative project between Michael and his wife, Paula Green. Paula's book, Aunt Concertina and Her Niece Evalina, is a children's story, which has been beautifully illustrated by Michael. Michael's first solo exhibition at Page Blackie Gallery is in February 2010.